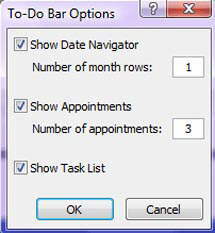 I don't know about you, but I really like the To-Do Bar in MS Outlook 2007 (it's on the right side of the Outlook 2007 program window). I find I'm constantly using the Task List to see what's due and to see what's coming up in the near future. At any rate, if you've grown attached to the To-Do Bar, but wish maybe one section wasn't displayed or you could see more than one month at a time, you may be happy to know that there are some options for you! 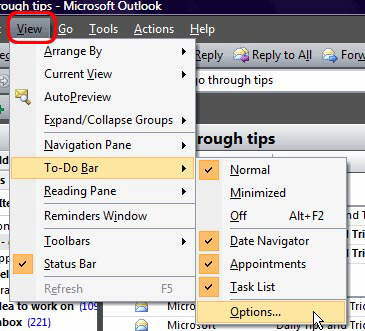 To see exactly what you can change, you need the View menu, To-Do Bar submenu, Options choice. When the To-Do Bar Options dialogue window opens, you'll see three settings, because there are three sections on your To-Do Bar. Let's begin by saying you can remove any of the three parts by unchecking it in this window. Beyond that, you can also control how many months of the calendar should be displayed and how many appointments you want to be listed. Check, uncheck and set the quantities as you like and then click on the OK button. You'll instantly find that your To-Do Bar has been updated to reflect your requests. At this point, we must discuss what might be an unexpected outcome. If you choose to show multiple months of the calendar, the calendar will take up more space. 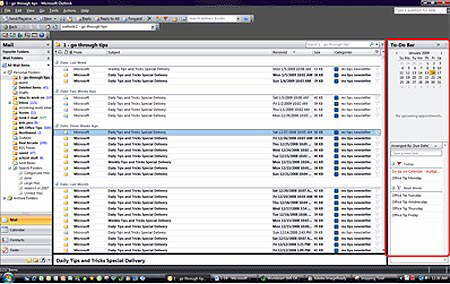 Outlook will then redistribute what space is left and you may find yourself with a vertical scroll bar in one of the other areas.